Another Champions League season, another Champions League debacle. Season after season, it has become a pattern for PSG in the Champions League. Every year they enter the tournament as one of the favorites to lift the title and every year they collapse to crash out of the competition. In 2011, when Nasser Al-Khelaifi took over the PSG project he had only one target in mind, to win Europe’s most elite club competition. Since then a vast amount of money has been invested, managers have come and gone, superstars have been signed but every season PSG somehow flatter to deceive in the Champions League. After the great debacle at the Camp Nou against Barcelona in 2017, PSG invested extensively in the transfer signing of Neymar Jr. and Kylian Mbappe in the hope of Champions League glory. However, nothing changed for PSG since then. In the 2018-19 season, PSG appointed Thomas Tuchel as their manager to deliver the coveted European glory which PSG were craving for after all those debacles in the past. However, just like the past, there was only further Champions League heartbreak. PSG again collapsed against Manchester United in the Round of 16 and surrendered a two-goal advantage in the home leg from their trip to Old Trafford to crash out of the tournament once again. What are the reasons behind PSG’s failures in Champions League? The biggest reason for PSG’s failure in Europe is the lack of competition in their domestic league. While all the other top leagues in Europe like EPL, La Liga, and Serie A have at least 4-5 quality teams fighting for the top prize at the domestic level, there is a massive gulf in the quality between the PSG and other teams in Ligue 1. Barring one hiccup in the 2016-17 season, where Monaco toppled the Parisians for the title, PSG are winning the league comfortably since the 2012-13 season. PSG are not used to playing against quality teams like Barcelona or Real Madrid regularly. So, when they play against the strong units in the Champions League, they often succumb to the pressure. Be it their thrashing of 6-1 at Camp Nou by Barcelona or Manchester United outclassing them 3-1 at the Parc des Princes; there was one thing common in both the fixtures; PSG got complacent. In the 2016-17 season, when PSG beat Barcelona 4-0 in their home leg, no one expected Barcelona to overturn the deficit but what happened then was no less than a miracle. PSG got complacent with their approach in the return fixture and collapsed completely. Barcelona thrashed them 6-1 and completed one of the most miraculous comebacks in the Champions League history. 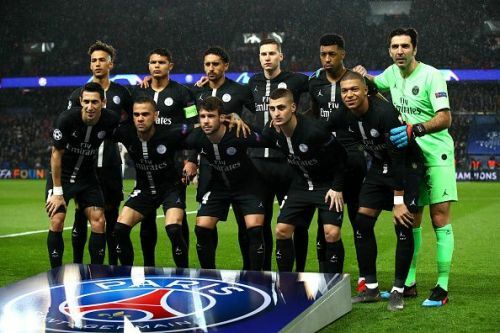 Fast forward to the 2018-19 season, PSG once again entered the tournament as favorites to lift the title and reached the knock-out rounds comfortably. They were up against a rejuvenated Manchester United side in the Round of 16, and the Parisians defeated the Red Devils 2-0 at Old Trafford in away leg. However, what unfolded in the home leg stunned everyone, as United's fringe team upset the mighty PSG 3-1 at Parc des Princes to advance on away goals and PSG were ousted from the competition once again. PSG took United lightly in the second leg and got complacent once again in the game they should have won and paid a hefty price for it. PSG have assembled a team of individual superstars including Neymar, Mbappe, Cavani, Di Maria, and Verratti among others. This team somewhere lacks the discipline required to play at the highest level which was evident from the Neymar and Cavani penalty fiasco. Football is a team game, and no matter how big a superstar one is, no individual can win you trophies alone. In a fierce competition like the Champions League, opponents make you pay even for the smallest of the errors. More often than not, individual mistakes have costed PSG heavily in Europe. PSG has lost the crucial matches due to individual errors which have resulted in their elimination from the Champions League over the years. PSG have all the required arsenal in their armory to become the champions of Europe. However, will they ever overcome their issues and lift the prestigious Champions League trophy is something that remains to be seen.